In most countries October is breast cancer awareness month. Let's "think pink" today! Please show my fellow Etsy sellers some love by clicking on their shops. Enjoy! Anlässlich des Brustkrebsmonats Oktober trägt meine Collage heute den Titel "Think Pink" ! This past weekend was an unusual one for me! I used to tutor kids as a side job. Well, one of these kids - now a university student majoring in art and technology - asked me to play a role in an educational short movie. Guess which role I got? Psychotherapist! It was all very short notice, so I had to learn my lines double-quick. Although it was quite challenging with indoor/outdoor scenes I enjoyed it very much. The crew and cast all came from different cities, even countries, so it was a lot of fun listening to them chattering in various languages! A big welcome to my new readers :) Nice to meet you - wishing you all a wonderful week! Yay for the film appearance Duni! Your talent is really diversifying. Hope you are having a great week! You know pink is one of my favorite colors too :) Love Sharla's earrings! What fun to get to be in the film! Let us know if they post any part of it on the web! dein Blog gefällt mir sehr was ich bis jetzt gesehen habe.Wunderschöne Bilder womit du vieles schön in Szene setzt.Komme bestimmt wieder vorbei und stöber ausführlich. What a fun project to help with! When I was in college a friend of mine had to do a movie for one of her classes (it had a political theme) and I was her candidate. Good times! How fun about the movie! What a fun weekend! LOVE the pink moodboard! Lovely mood board- really digging that pendant! How neat about you being in a film. Cool! Oh wow Duni! how exciting and fun! I'm pretty camera shy, so not so sure I'd like it :) I'd rather be behind the camera not in front! Nice finds! I like the mosaic tile. Congratulations on your movie appearance! It would be wonderful to see you! Any chance for a piece of that video to be published online at some point? ...Your Moodboard is lovely as always. i am not a fan of the very girlie style, but you somehow manage not to overdo it; always elegant! LOVE the pendant! Off to check that out. The girl wearing the sunglasses is too cute. 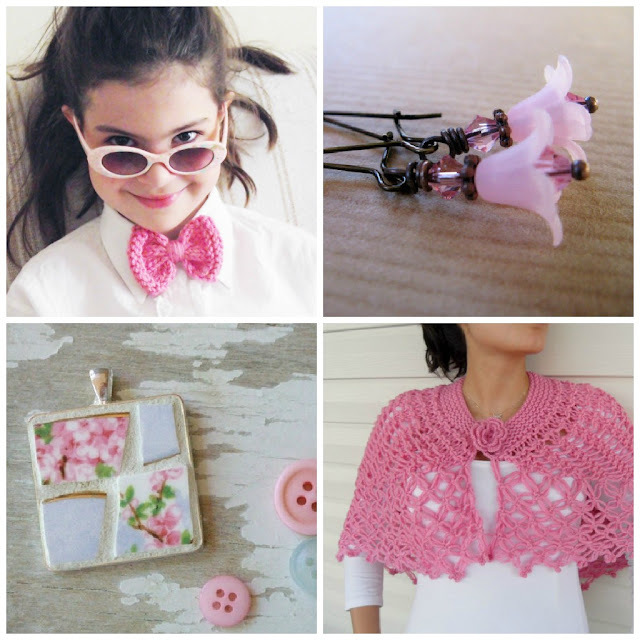 Pretty pink moodboard Duni! Thank you for including my earrings! I actually am donating 20% of my sales this month for breast cancer research as part of my Etsy Angels team fundraiser! Congrats on your film role! That's pretty cool! Das ist ja toll, Duni! Wirst Du den Film irgenwann mal sehen? Ich habe auch mal bei einem Filmchen mitgemacht, aber das ist schon viele Jahre her. Habe ihn nie gesehen. :) Mein Schwager ist übrigens Schauspieler und hat des öfteren bei einigen Kunstfilmen mitgewirkt. I love this shawl!!! Beautiful. It must have been so fun being in a movie!